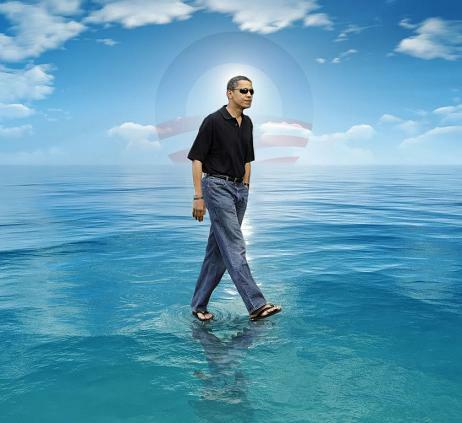 Then the seas ceased their rise because President Obama is way cool! Since the warming trend will otherwise return, he needs four more years. Vote early and often. Mother Earth demands no less. This article at PJ Tatler has links to many events attributed to global warming. Through a possible oversight, it does not include the 2008 election of President Obama and a Democrat controlled Congress. However, the problem may simply be that no such attribution has been demonstrated. That is the purpose of this article. Since existing data purport to show that there has been no global warming over the past fifteen years, it is necessary to provide accurate data to challenge this specious claim. These data were created through the scientifically proven method of moving the thermometer from north to south through 2008 and then, to be fair, moving it (slowly) back northward and finally again to the south. 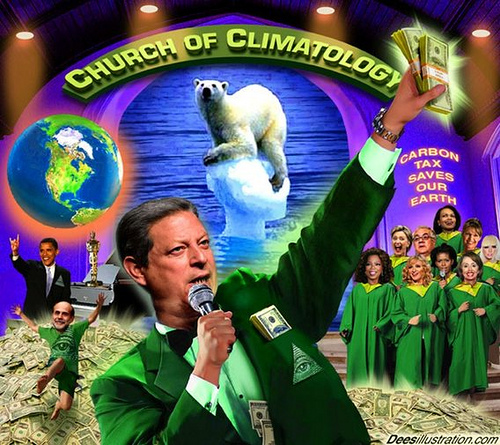 The indisputable scientifically based estimate that there will be a dramatic eight degree increase in global warming this year is not grounded in partisan political speculation; rather, in the spirit of transparency, it is candidly acknowledged that the thermometer was moved to Maracaibo, Venezuela in late 2011 to protect it from being frozen as well as from global warming deniers and other criminals. Even a high school student could understand this. It is obvious from the above data that it was much warmer than previously in 2008, the year that brought us the boon of President Obama and a Democrat controlled Congress and that, in the immediately following years, it became cooler until, in 2011, the Republicans assumed control of the House of Representatives. Just as the sun has little to do with global warming, the fair and reasonable scientific procedure of changing thermometer location has little to do with the measured changes in global warming. Having established such data, it only remains necessary to demonstrate a correlation with the Democrat landslide of 2008 and the comparable or even greater landslide scientifically predicted for this year. Since it has been demonstrated that global warming has a causal relationship to landslides, and because the relationship between physical landslides and political landslides should be obvious, it is appropriate merely to note that the human stress caused by global warming takes political form and that the elimination of stress is a necessary governmental function. Just as global warming brought us President Obama and a Democrat controlled congress in 2008 to reverse the warming trend, their success in bringing the change for which we had hoped mandates the repeat of 2008; accelerating warming — already occurring — combined with the stressful and obstructionist tactics of the Republican party can again be halted and must therefore no longer be tolerated. I have provided additional no less compelling reasons elsewhere to reelect President Obama. Computer models using proven Al Gore rhythms, that can not only be appreciated for their musical elegance but are completely reliable and patriotically financed by the sale of carbon credits, demonstrate beyond rational dispute that the reelection of President Obama and of a Congress dominated by Democrats can once again prevent the horrors of more and worse global warming (or, alternately, of a new ice age the means of preventing which are the same). Only a reelected President Obama empowered by a compliant Congress can ensure that we use no more carbon emitting fuels than can be justified by purchasing carbon credits. Those who deny these inconvenient truths for partisan political advantage must be stopped. “It is time that genuine global action is taken to enable people, markets and governments to make sustainable choices,” but then lists scores of ways that governments can restrict markets and remove choices. Almost all the recommendations would increase the scope and size of government at the expense of the people. The panel also suggested creating a “global sustainable development council” that would insure national governments lose their freedom of action as well. Only bigger governments and less freedom of choice, as righteously demanded by President Obama, are good and sustainable. The report warns of a dire future if its recommendations are ignored. The world has embarked on a path that risks “irreversible damage to both ecosystems and human communities.” While technological advancements have helped create many opportunities, not everyone has had equal access to them. Countries in the developing world in particular “risk growing economic stagnation and social unrest, as poorly skilled young people vent their frustrations at the prospect of a life of underemployment and stifled aspirations.” Actually, that sounds a lot like America under the Obama administration. We must adopt these salutary United Nations proposals, immediately, and thereby equalize the access of all nations to abject poverty natural resources. It therefore remains necessary to reelect President Obama and to give him a compliant Congress. If we fail, it will soon be too late and no congenial habitat for humanity will exist. After I have established and tested, scientifically, a secure Nigerian web site for the sale of carbon credits certified by the Nigerian Government I shall make a public announcement permitting investors who insist upon safe and reliable ways to earn maximum nontaxable offshore profits — while simultaneously promoting a stronger and better Earth for us all — to prosper beyond their wildest dreams. I am being assisted in this noble venture by the wealthy and generous son of a deceased Nigerian cabinet official to whom I was introduced by an e-mail that I was able to save from the wicked Spam filter demon. As this venture succeeds, he may offer additional opportunities to all investors. LEGAL DISCLAIMER: Counsel insists that I state explicitly that this is merely an attempt at satire, that no investment or other offering is made herein and that none will subsequently be forthcoming. I see the logic. I really do, and that worries me. And the video shows why a lot of people vote the way they do — they don’t have a clue. Happy Valentines’Day! Now that you think I am dumb anyway,I don’t believe I am as uninformed as the kids on the video,but I do believe in global warming. I like Al Gore,too. Wake up and smell the coffee,it’s burning. I do not think Obama will fix it,nor do I think whichever poor choice for pres.,you guys pick,from the wonderful ones you have running,will fix global warming.As for saving the polar bears,and whales, plus all the other species we are eradicating from the planet,I don’t think that will happen,either.It appears to be inevitible,because even with our eyes wide open,we can’t see the forrest for the trees. You remember trees,right,the tall things that make our air breathable that we destroy, so we can wipe our booties?